Hamilton heads to Henderson in a new exhibit located on the second floor of the library, in the Learning Commons. This exhibit details the fascinating history of events that occurred in the life of this famous Founding Father, whose story begins on a British Island colony and ends with the infamous duel that occurred between himself and his rival Aaron Burr. This exhibit also pays homage to the institutions that Hamilton founded such as the First Bank of the United States and also his other not-so-well-known projects such as The New York Post and The U.S. Coast Guard. 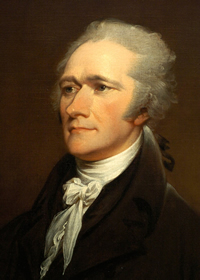 If you are a fan of the popular musical Hamilton, then please stop by to take a look at our exhibit!